One: When did you realize that a writing and academic career was in the offing? Was there a life-changing event that crystallized that moment? Ching-In Chen: I’ve told stories to myself since I was very young as a way to survive being outcast, but I didn’t set out to become a professional writer or have a career in academia. I was always drawn to writing as a way for me to make sense of the world and also because I loved reading and being lost in other worlds, but it often felt like those worlds weren’t always made for a reader like me. So I kept returning to writing, but always assumed I would just fit it into whatever I was doing on the side, when I could. There were two key moments which transformed the way that I thought about my writing, where I realized that I needed to commit to center my writing as more than a hobby. Both happened during the Voices of Our Nations Arts Foundation writing workshops for writers of color. The first was hearing Justin Chin speak on a panel about how to live a writerly life. When he said “You have to find a way to make your life fit around your writing, not the other way around,” I felt recognition that I had to invest energy, effort and belief into my own writing. That was one of the first moments that I started to understand that the writing was something I needed to nurture if I wanted to take it seriously. The second transformative moment was in a poetry workshop with Suheir Hammad. I was having a hard time balancing my job as a grassroots community organizer always on the clock and my commitment to my writing. In those days, stealing time and energy for my writing felt very selfish, like I was taking time away from the community to work on something I wasn’t sure benefited anybody but myself. In the workshop, I voiced some of my self-doubt, confessing that I thought my poems were worthless. Suheir kicked me out of the room immediately for saying that my poems were worthless, but then came after me. In the hallway, she told me that I could never say that my writing didn’t have value. Then, she changed the workshop format we had been following; she said it wasn’t what I needed as a writer. Instead of having me present my poems and having my peers “workshop” the poems, she had them go around the room and tell me what they got out of my poems. Every one of them said something different, but the common underlying word spoken was “love.” That exercise helped me to see that I did have my own contributions, distinct from those writing around and with me. Going back to get my MFA and then my PhD were ways for me to invest in centering my own writing, as well as ways to strengthen my credentials so that I could also help support other voices to write what I wanted to see in the world. Two: In the February Radar Productions reading at the San Francisco Library, you said something about teaching your students how to experiment on free form verse? How did the idea come about and will it be published? 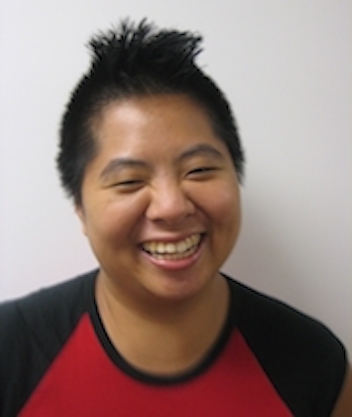 Ching-In Chen: In the front end of all my creative writing classes, I bring in a wide range of writings and ask my students to try them out in the form of experiments before we get into workshop critique. I encourage them to think of all their writings as having some kind of structure, even if it’s not a formal poetic form they are familiar with such as the sonnet, and as a way to deliver the content of what they want to say in a poem. I’ve had some wonderful teachers such as Juan Felipe Herrera who opened up the possibilities of a poem in all its various ranges and registers and encouraged us to write as much as possible, up to ten poems a week. I have had several students who have published their work. Three: In your new book, recombinant, the spatiality of words struck me. Can you please speak about your craft strategy for this? What does space communicate in this particular book of poetry? Ching-In Chen: This book, and much of my own writing, is fused by a desire to learn what I wasn’t taught – about the history of Asians in the United States and in the diaspora. Much of this writing has been around buried history which isn’t “whole” or easy to access and digest. I had to go out “hunting” and looked for evidence in census records, on insurance maps, in old city books, and other kinds of archives, but there were certain things I couldn’t access, an everyday kind of living which was lost to me. Much of the white space accounts for this process of research and trying to piece together from your limited archives a kind of knowing, which includes an acknowledgment of what you don’t know or might now know through a traditional way of knowing. Four: How does activism play a part in your teaching and writing process? Ching-In Chen: I very much believe that writing is a way to change the conditions of the communities you live in, through developing imaginative capacity. Much of my own writing process is grounded in an engagement with my community concerns and often come out of that work. For instance, some of the poems in the latter part of the book which reference protesting on the street came out of marching for justice for Dontre Hamilton in Milwaukee, a black man with a history of mental illness who was shot 14 times at Red Arrow Park. At the time, there were also gender-non-conforming folks who had been killed by police brutality such as Jessie Hernandez who were also in the forefront of my mind. In my teaching, my goal is for the students to work on finding out what they want their poems to do in the world and how to do that. I do believe that learning this process is part of developing future imaginative capacity and flexibility for that kind of change, but I don’t necessarily want to dictate to them how to do that. Because of this, I usually try to bring in a wide range of what might be possible and then have them find which voices and lineages they want to be in conversation with. I have also learned a lot from the students in my classroom in terms of how to make what I do more accessible. For example, I’ve recently had one student who is partially deaf in the classroom for the first time, which caused me to research ASL poetry slam and other deaf poets to bring into the classroom. This has benefited me as a teacher and the other students in our classroom. Five: Which project/book that you’ve published made you think you could do it over again in a different way? How would it be different? Ching-In Chen: This is a tough question, perhaps because I don’t necessarily think that way about projects. I think of projects as arising in that time and place – and then I move onto a different approach. This doesn’t mean I’m not circling around an obsession, but that the earlier writing allowed me to get deeper or to another level. So I don’t know if I would change that process. Perhaps the only thing I might wish for is that I started taking my writing more seriously at a younger age, but I guess that floundering around is also part of the process which I learned from. Six: Tell us about a typical Ching-In Chen writing process. What inspires you and how do you come up with the final product? How do you revise? Ching-In Chen: My writing process has changed since I committed to taking the writing more seriously. Before then, I just waited for inspiration to strike, which usually meant I was only writing when I was processing something intense and upset or when I had an external deadline. When I decided that I wanted to be more serious, I realized I needed to develop an ongoing writing practice. I started looking at my time at the page as a kind of spiritual practice – one of taking my own words seriously and of the time needed to slow down and invest in them. My goal (which I’m always reaching for, not perfect at achieving by any long stretch) is to write three pages of morning pages in the morning and to produce one new creative piece (or revision) by the end of the day. I joined an accountability group called The Grind, where you commit each month to send a new piece or revision by midnight, which has helped me produce and revise much of my work for the last few years. When I fall off of keeping up the practice of these rituals, I know that I’m unbalanced and usually something needs to shift in my life so I can return. Lately, especially with recombinant, my revision process has been to feed one strand of writing into another to see what the juxtaposition produces. I’ve learned a lot from this process about improvisation and letting go, both valuable processes in revision. Seven: Who inspires you? Who do you most identify with, past or present, dead or alive as a writer/artist? Ching-In Chen: So many! To make it easier, for recombinant, these were the writers/artists who were really important to my process: Craig Santos Perez’s from unincorporated territoryseries – for the way that he juxtaposes historical documents and maps; M. NourbeSe Phillips’ Zong!– for how much she was able to excavate from that one legal document about the history of the Zong! slave ship; Myung Mi Kim – for the idea of having to construct our own language register by register because we’ve never seen it before. As an artist, I keep coming back to the Southern California assemblage artist Noah Purifoy who moved to Joshua Tree to create these large-scale sculptures of junk after doing the same in Watts after the riots. Foglifter is open for submissions to our fall issue until May 1. Submit here! Help us continue our mission of providing a platform for intersectional queer writing. Donate today! © 2018 Foglifter Journal | All Rights Reserved | Site Created with Flair.